To succeed in the year of the Goat, those born under the Chinese animal sign of the Ox are going to have to learn to be flexible. 2015 is not the time to be stubborn and fixed in your plans. Life is going to bring lots of changes your way predicts the 2015 Chinese Horoscope. The best thing you can do is be flexible and accept them. Once you relax and go with the flow, you will find yourself enjoying the new opportunities life is presenting you. 2015 – The Year of the Wood Sheep is going to bring lots of changes for the Ox. As long as you embrace the changes and allow yourself to be adaptable, you should be OK. In fact, if you let yourself enjoy the changes instead of trying to stop them, you will find 2015 to be a very enjoyable year. You just have to relax and go with the flow. Chinese Ox astrology 2015 forecasts show that your romantic relationships are going to be more intense in 2015 than ever before. You may find yourself falling more deeply in love than you ever have in your life, whether it’s with someone new or with your existing partner. Your emotions are so intense right now, Oxen, and it’s making you a better partner. The changes in your life this year are making you realize how much you value a steady relationship. So you are willing to devote yourself to making your love relationships work. 2015 is a year of change for you, Oxen. You will be presented with many new opportunities and it’s up to you to decide if you want to grab onto them. This change could mean a new demanding project at work, a new side venture or even a whole new career. Whatever form these changes take, you have to decide if they will help you get what you want out of life. Your finances should be ok this year, Ox. In fact, you may find yourself coming into some extra money this year, from an unexpected source. It might be tempting to spend this new found wealth on something fun. But with all the changes going on in your life, the practical side of the Chinese Ox zodiac sign will be warning you to save some of it for a rainy day. The Chinese Ox horoscope 2015 predicts no major health worries for you this year. As long as you take care of yourself, everything should be good. Your loved ones may not be as lucky. You will find yourself putting their health first, which is admirable, but you need to make sure not to take on too much. You will face challenges in your other relationships this year, Ox. You will find that your friendships are changing and that some will drift further apart. It’s time to let a few people go and to draw the rest closer to you. Family relationships will present certain challenges this year and you may find that your loved ones are counting on you. This is the time to show how sturdy and dependable you really are. 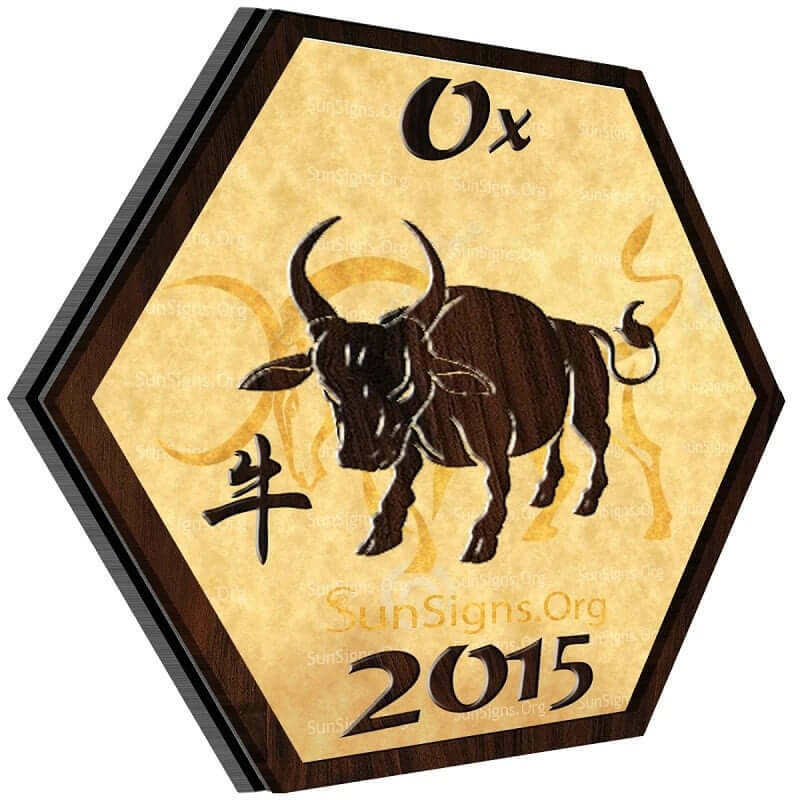 With all the changes coming your way this year, this is a good time to think about furthering your education suggest the Chinese Ox zodiac 2015 predictions. If you’ve always wanted to go back to school or take some night classes, this is a good time to do it. Enriching yourself opens up the door to even more opportunity. 2015 is a great year for travel, Oxen. There are a lot of changes coming your way and some of those changes are going to bring opportunity for travel. You should leap at them, because a change of scenery will do you a lot of good this year.